The Millennial Research Report has many in-depth features including brief videos of respondents. It is very accessible and well organized and I encourage you to see the whole report if you are interested in engaging this demographic – 18 – 34 year olds with your nonprofit. One of the best features of this report is its recommendation section – called Millennial Impact Benchmarks. 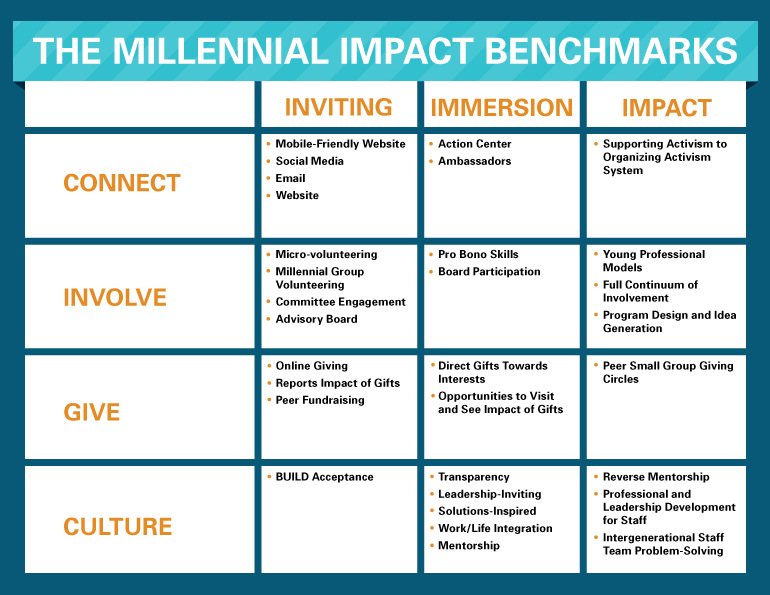 The Millennial Impact Benchmarks provide a path that any organization can follow to develop its culture toward Millennial engagement. The system is three phases levels—Millennial Inviting, Millennial Immersion, and Millennial Impact each describing how you can work with Millennials to connect, involve, and give at each level. Immersion – Millennial Immersion is the second level of Millennial engagement. Organizations that reach the benchmarks of this level have designed programs with Millennials, not just for them. 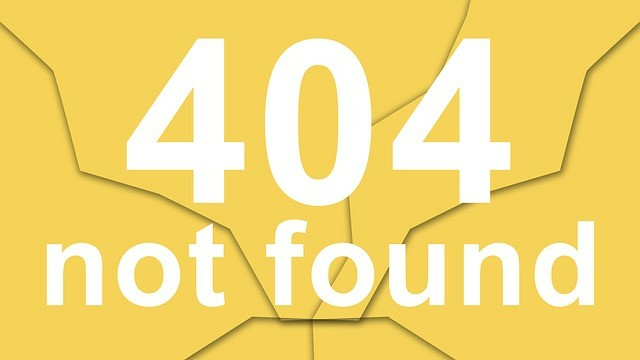 At this stage, Millennials are actively participating in unique ways to help the cause enhance awareness and outreach efforts of the community. 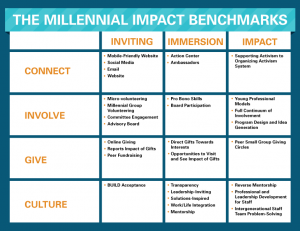 Impact – Millennial Imoact is the third level of Millennial engagement. The ultimate goal – the pinnacle of a Millennial engagement strategy – is to provide leadership, service and truly transformational opportunities for Millennials to affect the direction of the community. The full Benchmarks section with four detailed grids can be found here. An important way we make progress on any front is to assess where we are, set benchmark goals to attain and develop and follow an action plan. This reportk provides a roadmap for doing just that in engaging with Millennials. There’s no time like now to begin.